Picturesque Chipping Campden, in the northern stretches of the Cotswolds, is both famously pretty and elegantly varied, with its high street showcasing several centuries of architectural styles all in one long, terraced row. It seems appropriate that, across the fields, there’s a place similarly diverse in style, but just as pleasing on the eye. 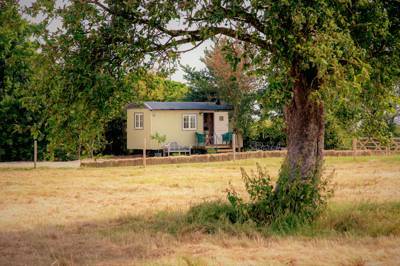 Campden Yurts is a hillside small holding turned glamping site offering simple, comfortable, family friendly holidays. Where once goats, ponies and chickens roamed and rows of vegetables grew, there now sit two spacious, 18ft yurts, each accommodating up to five people. A wood-burning stove, rugs, sheepskin throws and fold out futons dot each interior, while a main double bed boasts views up through the central crown window to the stars above. During the day natural sunlight pools through the circular space, while a discreet solar power battery system allows for some extra lighting at night. In addition, each yurt has its own private bathroom, and they also share a well-equipped kitchen room. Despite this excellent self-catered set-up, owner Jane particularly likes seeing guests outside their yurts, where tripods and grills are provided for a more authentic cooking experience. 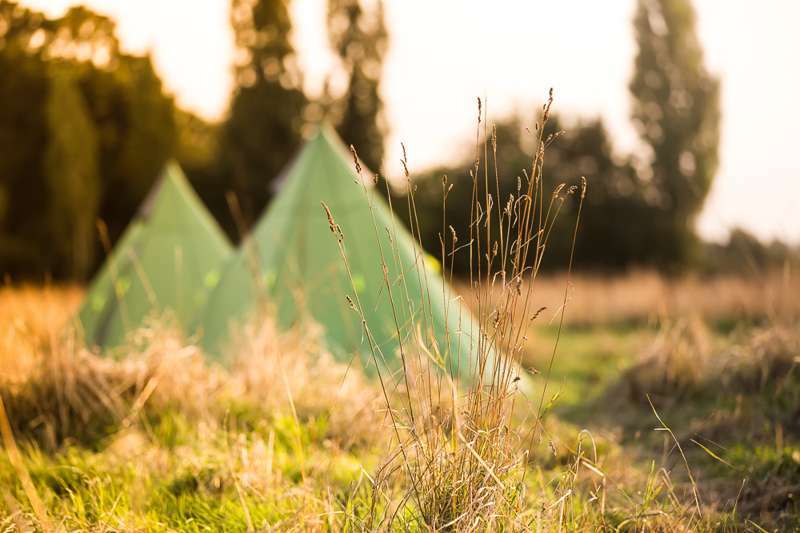 Campfires are very much a part of the Campden Yurts experience and if you really fancy taking it up a notch, there’s even a cob oven you can use, lighting a wood-fire inside and cooking your own pizzas. Stretch your legs with the short walk to Chipping Campden where you can stock up on goodies from the local delicatessen and grocery stores – the market town is brimming with refreshing, independent shops, galleries and a museum celebrating Campden's Arts and Crafts movement – then take a break in one of the tiny tearooms. It takes around 15 minutes to stroll the footpath into town. Popular waterside towns, Upper Slaughter and Bourton-on-the-Water, are also both just a short drive away. Each vies for the title of the prettiest town in the Cotswolds. Alas, not every town can win that accolade, but Chipping Campden is certainly on the shortlist. What with its honey-coloured houses, 17th-century market hall and cluster of National Trust-owned properties, it really does offer the quintessential Cotswolds experience. 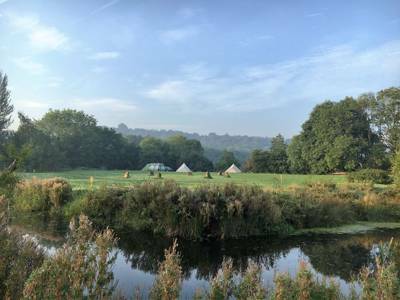 And now, with a yurt glamping retreat on the doorstep, it’s on the shortlist of Cool Camping’s favourite places too. 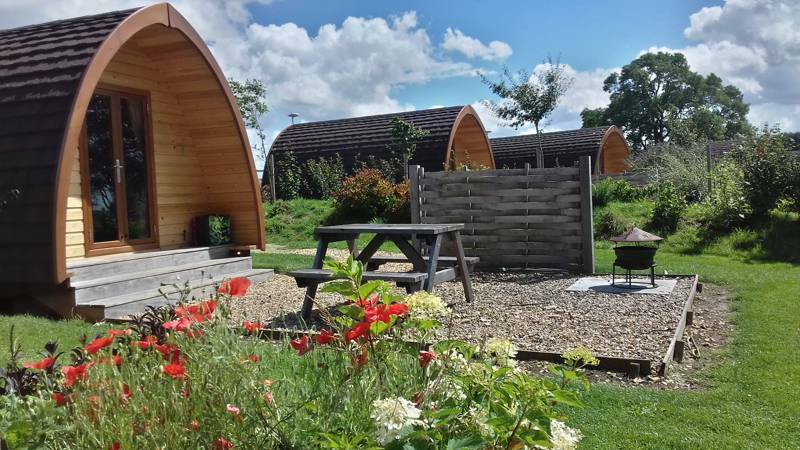 A new glamping site in the North Cotswolds offering a warm welcome and comfortable accommodation in two 18ft yurts. Taking families of up to 5 or 4 adults per yurt. Double/King size beds, futons, woodburners and drinks making facility in each yurt and hot showers, flushing loos and outdoor covered cooking area. Campfires encouraged and cob pizza oven also available. 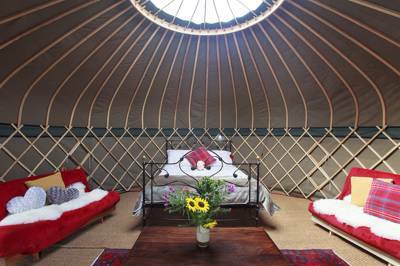 For latest availability and best prices for Campden Yurts, please use the Date Search above. 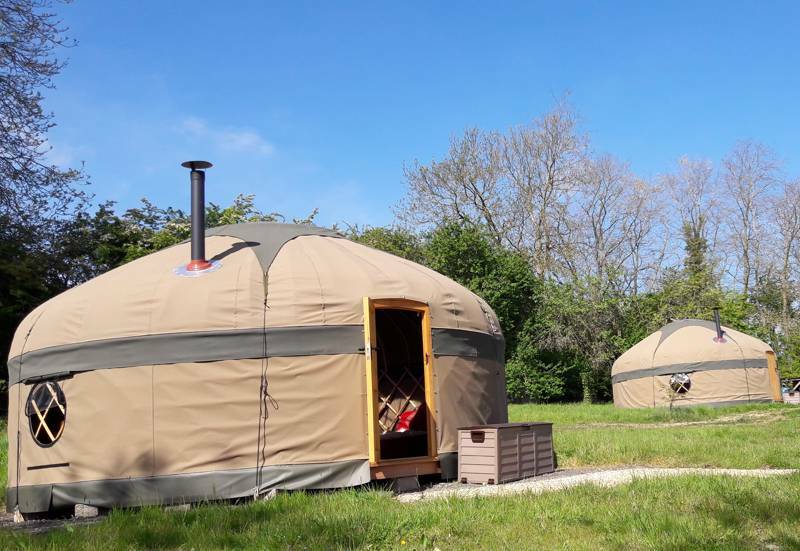 A pair of 18ft yurts, each sleeping up to 5 people comfortably. Furnished yurts with double beds, bedding and linen, blankets, rugs, wood-burning stove, storage, lamps, solar lights and phone-recharging and a 2-ring gas stove for making your morning cuppa. Each yurt has its own dedicated bathroom within the field with flushing loo, sink and electric shower. Kitchen with fridges, microwave, washing-up facilities and food storage. Outside covered cooking area with seats and tables too, next to the cob oven. Campfires (and campfire cooking) encouraged. Weekly pizza evenings using the cob oven. Free-range chickens roaming around the place. Ample car parking at the entrance (close to the yurts) and wheelbarrows can be used to transport bags/sleepy children the short distance to the yurts. Adam Henson, of BBC Countryfile fame, has his Cotswold Farm Park (01451 850307) a few miles down the road and the Cotswold Wildlife Park (01993 823 006) is also in nearby Burford – both great for families. For many, simply exploring the pretty Cotswold villages is the main attraction. Easy but pleasant footpaths link most together, so bring a good OS map of the area. Chipping Campden is just across the fields. The village Church – St. James – at the north end of the town is famed for having one of the oldest altar tapestries (pre-Reformation) and largest brass works in England. And the village high street is famously pretty but unusual – long, broad and flanked on each side by an almost unbroken single terrace of varied architectural styles. Broadway, Stow-on-the-Wold and Bourton-on-the-Water are a short drive away, as well as Stratford-upon-Avon and Oxford, a little further. The yurts are well kitted out for self-catering (and campsite cooking) and from the rustic, characterful porch shop guests can buy homemade jams, marmalades & chutneys, and seasonal produce (when available) including tomatoes, plums, apples and (occasionally) eggs from the hens. Plans are afoot to develop the vegetable garden to provide a small amount of ‘pick your own’ veg too. In Chipping Campden there are a number of tea-rooms, pubs and restaurants including The Cotswold House Hotel (01386 840330), The Noel Arms (01386 840317) with award-winning curry nights, The Kings Arms (01386 840256) and The Bantam tea-rooms (01386 840386). Chipping Campden also offers shops including the Co-Op, One Stop and a greengrocers selling local produce(01386 840577). Chinese and Indian take-aways available too. Late March – October (weather permitting). 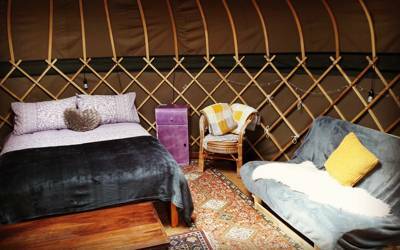 Yurts £75–£95 per night but with 3 night, 4 night or 7 night breaks only. From the M5, junction 9 Tewkesbury/Evesham. Follow A46/A44 and take the first left at the top of Fish Hill. Stay on this road for approximately 3 miles and Campden Yurts is on the right. Use Sat Nav 'GL55 6PN' but do not turn off King Combe Lane – the site entrance is on the road, do not follow the farm track opposite. Moreton-in-Marsh and Honeybourne are the nearest train stations. A small number of local buses do service Chipping Campden too including Excel.